RASM has been in use in the outdoor education industry for more than a decade. Developed by Rick Curtis, founder of OutdoorEd.com, as a tool for outdoor programs to manage risk from the field staff to the board room RASM presents a comprehensive model for assessing and managing risk in all aspects of your programming. Along with this article there are a variety of free resources for you to implement RASM in your program including a detailed PowerPoint presentation for staff, sample accident scenarios for analysis and the complete article. The RASM model has been presented at conferences around the world. To start we need to come up with a working definition of Risk, certainly not a final definition, but our working definition for today. Risk has been defined in a number of ways. In many ways we have been limited by these definitions of risk as a negative concept. We see risk as this thing we have to battle against, we have to “manage” risk because it is the “enemy of safety.” There are other definitions of risk. In the financial industry risk is both the potential of losing something of value and also the potential for gaining something of value. In this definition either action or inaction can lead to both positive risk and negative risk. This is a much more dynamic definition of risk and perhaps more applicable to our field. We all know about the negative model of risk, what is the positive side of risk in our industry? Risk is an underlying principal in all of outdoor and adventure education. The fundamental philosophical principles of Kurt Hahn and others is that the exposure to risk/challenge is what impels people to personal growth. Somehow we have to reconcile these two very different concepts of risk – risk as the destroyer and risk as the creator. Without trying to be overly philosophical, there is, perhaps, a kind of Yin-Yang relationship between risk as creator and risk as destroyer. Perhaps, it is not possible for risk to act as a creative (growth) force unless there are also potential negatives that can take place. The negatives are the whetstone that sharpens the blade of creativity. How do you look at risk globally and integrate -R and +R into your program? I hope that might be an interesting discussion to have some time within your organization. Since most of us are here at this conference to focus on -R let’s turn to a more in-depth look at how and why loss happens. We are going to look at how to Manage our Program Activities to Prevent Loss. At some other outdoor education conferences not focused on risk others can take up the discussion of how we Manage our Program Activities to Create Gain. A number of other models for accidents have been utilized in the past. The two best known are the Dynamics of Accidents Model© developed by Alan Hale in the early 1980’s. The other is the Accident Matrix© developed by Dan Meyer (1979) and refined by Jed Williamson (1984). The limitation with these early models is that they focus primarily on the negative causative factors of the loss. While they provide a tool for examining causes after an accident, they don’t adequately address solutions to prevent accidents. If the only factors you are tracking are the “negative causations” that leads one to the interpretation that reducing the possibility of the accident is accomplished only by removing or negating the negative causation. The Risk Assessment and Safety Management model (RASM) is a holistic model that combines the negative factors as well as the positive factors. This allows us to think not just on what can go wrong but also on what can go right. RASM provides program managers and field staff with a model that addresses these needs. This means that you multiply the Probability that something will occur times the Severity if it does. For our discussion we can set a scale of 1-10 for both Probability and Severity. That means the lowest Risk Level could be 1 and the highest level 100. Example: the Probability that novice hikers on an extended backpacking trip will get blisters is moderate. Let’s give it a 5 on a scale of 10. The Severity of blisters is low. Let’s give it a scale of 2. Multiplying the two scores we get a 10 Risk Level. 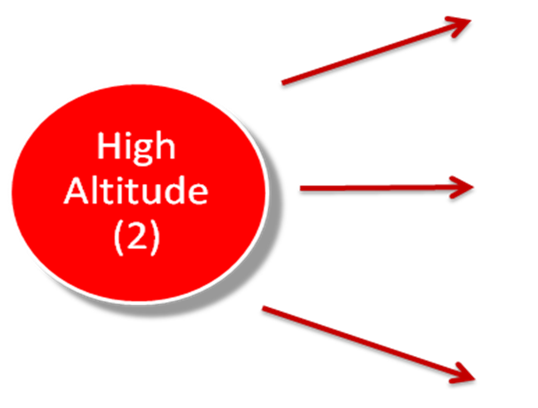 In the diagram below we can represent the Risk Level on a horizontal scale. Imagine the black disk as the Risk Level. It can move left to the Low Risk end or right to the High Risk end. Note: For simplicities sake in the rest of this article we’ll use a scale of 1-5. 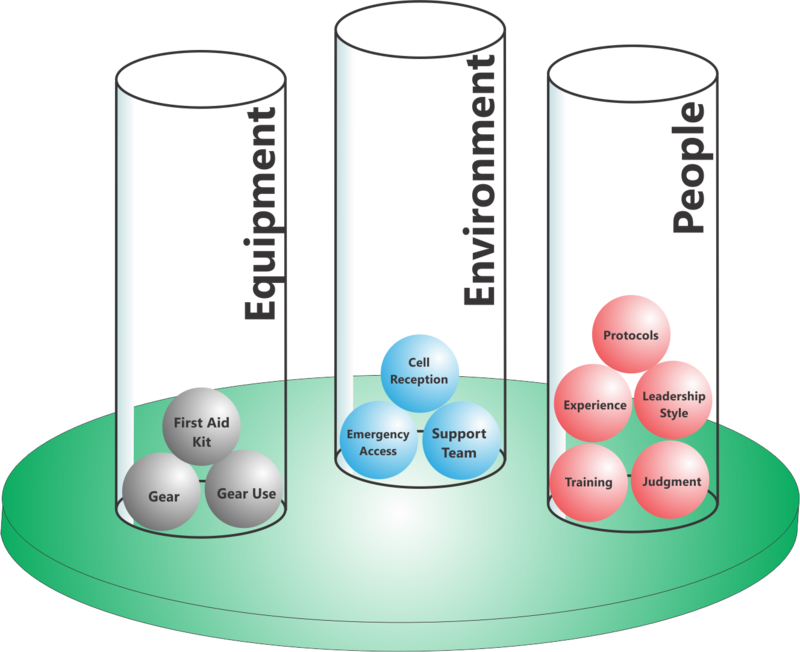 Let’s imagine a balance with three different Hazard Cylinders—Environment, Equipment, and People (also known as Human Factors). Into each of these we can add hazard factors. 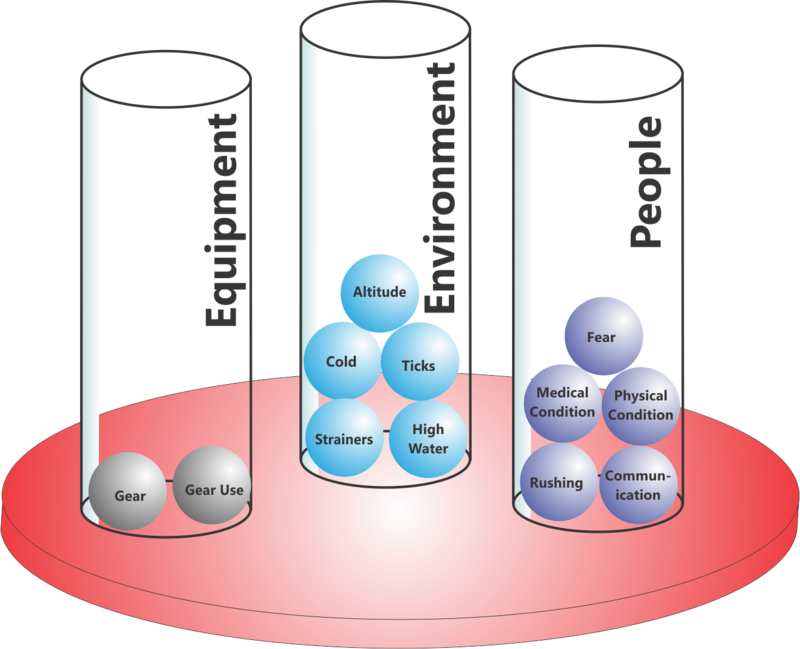 The more the factors the greater the potential for -R.
If we take a look at a sample scenario we can see each of the Hazard Factors as marbles, the more marbles in the cylinder the greater the “Hazard Weight” on the scale. So let's take a look at the overall risk assessment and safety management model in the following graphic. What you see here can be thought of as a simple balance scale. If we look on the left side we see a series of hazard factors that fall into three categories: Environmental Hazards, Equipment Hazards, and People Hazards. In the center we see risk levels. As Hazard Factors accumulate on the left-hand side of balance scale, here shown as adding balls into the cylinders, the Risk Level cylinder increases. Increasing the risk level doesn’t mean that you are going to have an accident, just that the potential for having an accident is increasing. Calculating the impact of risk is more than just identifying the particular hazard. It’s also important to recognize that some hazards have more impact than others. 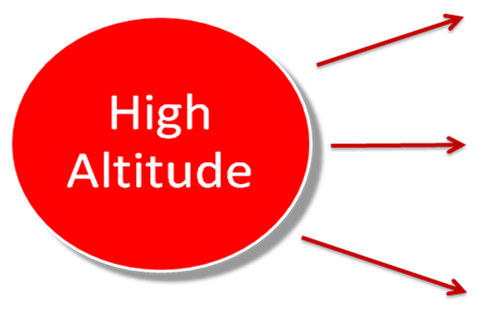 Let’s take the example of High Altitude. 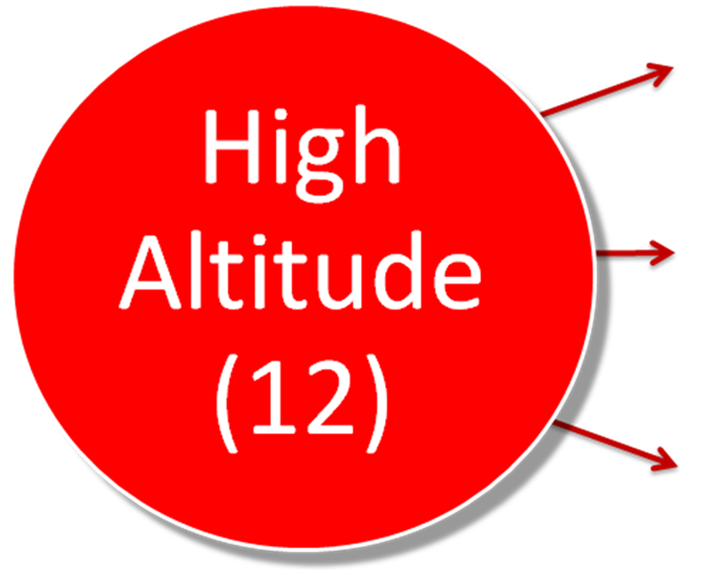 There are a number of illnesses associated with High Altitude. Scales of course mean that there is something being balanced against; those are the positive factors – Safety Factors that work to reduce the potential for loss. Once again we can see each of the Safety Factors as marbles, the more marbles in the cylinder the greater the “Safety Weight” on the scale. Safety Weight acts to counterbalance Hazard Weight. 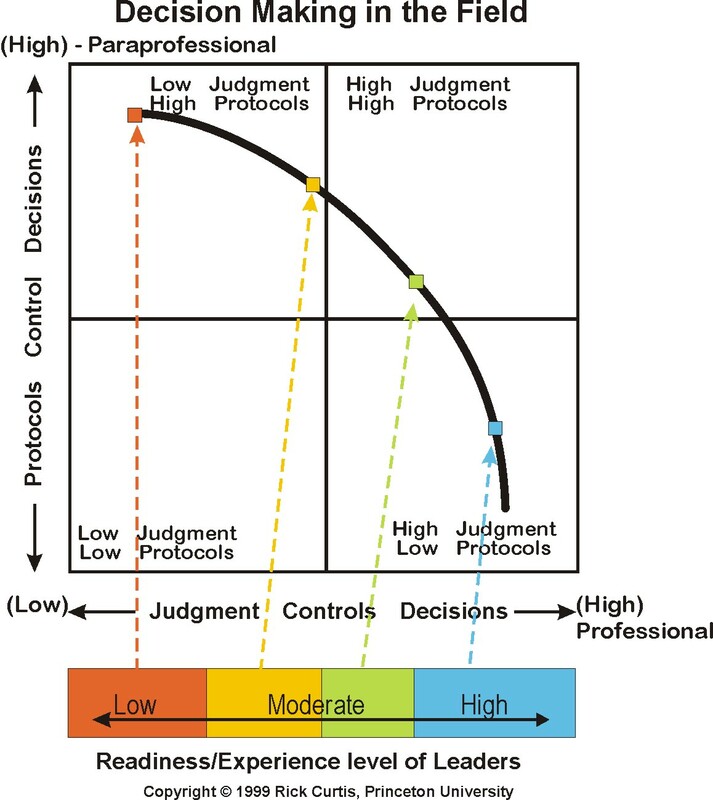 Here we can see things like Training, Protocols, Judgment, etc. all of which are things that we actively work to develop in our programs to counteract/counterbalance the Hazards Factors. Our model so far shows Hazard Factors and Safety Factors, but how do they interact to determine potential Risk/Loss? Now we can see the other side of the RASM model. On the right side we now see another part of the balance scale-the Safety Factors-in three categories as before: Environmental Safety Factors, Equipment Safety Factors, and People Safety Factors. 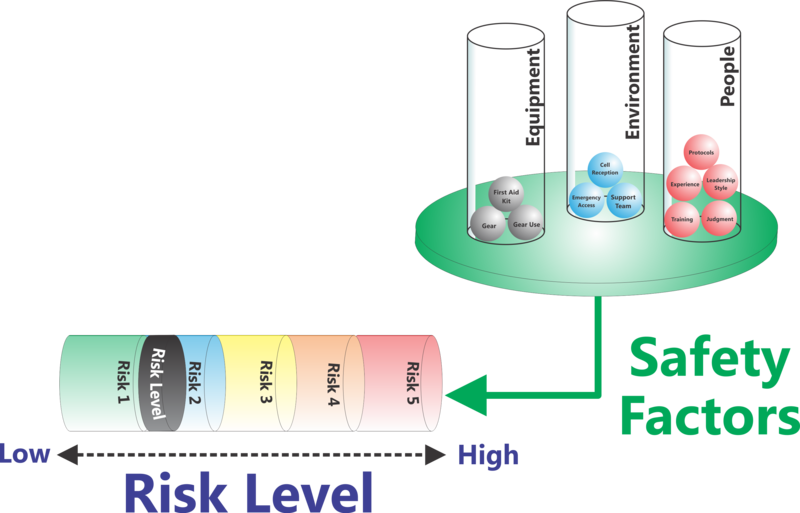 When we add “balls” into the Safety Factors we make the risk level go down. Of course it will never go to zero, but we can reduce the risks by adding Safety Factors in. Now that we have all of the components of our Risk Assessment Model, let’s put them all together. Reducing the Risk Level happens in two ways. We can reduce or neutralize the Hazards Factors or we can increase the Safety Factors. The thing that is important to realize is that many Hazards and Safety Factors are completely interchangeable, that is they can be either one or the other. Decision Making for example, can either be a Safety Factor if it is done well or a Hazard Factor if it is done poorly or not at all. 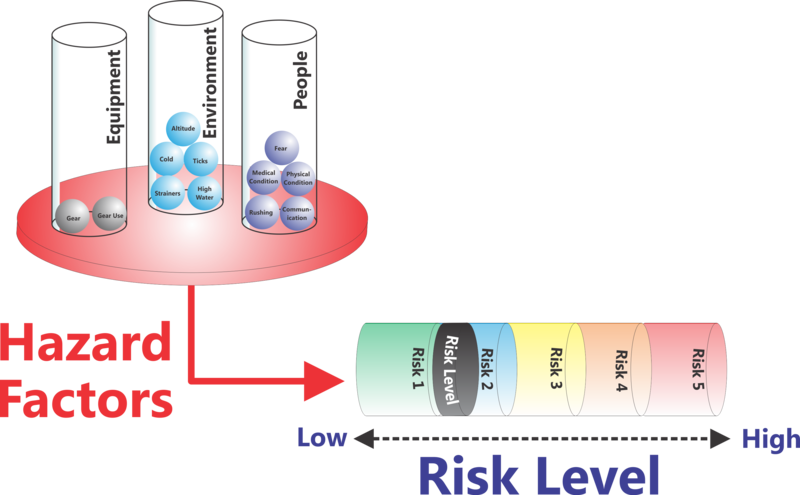 Reassess the Risk Level - what if that’s not enough? Many people are familiar with the Patient Assessment System (PAS) taught in first aid courses. The Risk Assessment & Safety Management Model follows a similar pattern. I find that it’s helpful in teaching RASM to link it to concepts that people are already familiar with. Start with a baseline assessment of the Risk Level (First Triangle: do the scene size up to assess safety, mechanisms of injury and number of patients). Treat the immediate hazards (Second Triangle: solve primary system problems). Reassess the risk level (Third Triangle: do a full patient physical, SAMPLE history and vital signs). Add Safety Factors (develop a problem list and treat your patient). Reassess the risk level (continue to monitor). There are situations where you simply cannot reduce the Risk Level to something acceptable for your program. In that case ‘bailing out’ should always be seen by staff as an option. Bailing out can mean many things depending on the situation and location. It can mean camping in place, changing the route or even ending the trip. Letting staff know that this is acceptable is one more “Safety Ball” for your program. We talked about adding Safety Factors. To dive into this more deeply we can add the concept of Safety Response Levels which are phased increases in safety readiness. Obviously we are always alert for hazards and are actively trying to reduce the potential for loss. However, as the Risk Level changes, so must our actions and leadership behavior. We have to “boost the radar” in both Safety Actions and in Risk Response Readiness, our capacity to respond. Safety Response Level 5 - Maximum safety alertness & maximum response readiness. Okay so we have these different levels, what do we do with them? There are three aspects to using the RASM model. Identification of the negative Hazard Factors that serve to increase the Risk Potential. Identification of the positive Safety Factors embodied in your programs which are designed to counteract hazards. Determine the Current Safety Response Level and apply the appropriate policies/procedures for that level. We can think that as the Hazard Factors increase and/or Safety Factors decrease then the Risk Level goes up and the Safety Response Level rises. Safety Factors can also be thought of as your Resource Level, your capacity to respond to an emergency or incident. At each point where you cross into a higher Safety Response Level, your operating protocols and guidelines may need to change. Routine – the base level of program operations. It assumes the activity is exposed to the Inherent Risks identified. EXAMPLE – On Star Trek Scotty calls up from Engineering “Cap’n the Klingons are attacking and the shields are down to 20%. What are we going to do?” So both the Hazards are increasing and the Resource Level (CTR) is reduced. That means you need to move to a higher Safety Response Level. One of the most familiar uses of the concept of Safety Response Levels comes in whitewater paddling. The International River Classification Levels are comparable to Safety Response Levels, the higher the level the greater the potential for loss. What is also true in the River Classification system is as the level of difficulty increases, the Resource Level (skill level, judgment, etc.) of instructors and participants needs to increase in order to maintain operation at an acceptable Risk Level. In whitewater paddling moving from one level to a higher level often means changes in operations. Even on one river. Say a group is paddling on Class III and scouting from the river. They come to a class IV and scout from shore, potentially set up rescue lines below, add safety boats, etc. In the RASM model any change in Risk Level may require a Protocol/Safety Action Change to compensate. Part of your program strategy has to be identifying the highest Safety Response Level your program can operate on. At the same time staff need to be able to assess the Safety Response Level. If you are operating at a Safety Response Level beyond your capacity, you are at significant risk for a catastrophic system failure. Protocols therefore should be looked at as Safe Response Level dependent. There are minimum level protocols that are used in all aspects of your program (things like medical screening, equipment checks, etc.). These protocols exist at Safety Response Level 1 and remain in effect throughout. Others change as we saw in the whitewater paddling example. It is important to recognize when a threshold level is reached that places you in a different Safety Response Level and then know what changes in operating protocols are appropriate for that Safety Response Level. You will need to continue to monitor your Risk Level and Resource Level to check the Safety Response Level and modify your procedures accordingly. Paul Petzoldt, founder of NOLS and WEA once said, “Rules are for fools.” This has sometimes been misinterpreted to mean that there should be no rules simply rely on instructor judgment. Drew Leemon, the NOLS Risk Manager, once asked Petzoldt what he meant. Petzoldt replied that he meant was that there was no way to write a rulebook that would cover every situation an outdoor leader might encounter. So you couldn’t have a rule for every situation. At the same time he didn’t mean that you should have no rules. The real goal for instructor judgment is to be able to determine if you should implement the rule or if the situation required that you do something else. I once had a long discussion with one of my leaders about this. I had said that student leaders need to follow program protocols and that they also needed to use their judgment. She became very flustered by this. She wanted one answer, “do I follow the protocol or decide on my own?” I told her that she should follow the protocol but that didn’t mean turning her brain off. To use a different example, soldiers are supposed to follow orders in the field. At the same time soldiers are not supposed to simply turn off their brains. They need to be able to question orders if those orders don’t make sense. So there must be a place for rules within the risk management context. We have to balance the rules, protocols, etc. developed as part of our RASM Model with sound judgment by instructors on when to apply those rules. The diagram below shows a basic model for identifying a balance between rules and instructor judgment. For working with a college outdoor education program my point on the curve is up and to the left. For an experienced mountain or river guide the point will be further down and to the right. Even the most experienced people can make mistakes. I tell a story about when I was on a trekking trip in Nepal with a group of sixteen people. We hiking over the Thorung La Pass on the Annapurna Circuit. We arrived at 14,500 feet and the next day were to hike up to the top of the pass at 17,700 feet and back down to the next village at 12,500 feet. When we woke up for our predawn start it was snowing heavily and below 0° F. Normal temperatures on top of the pass were supposed to be 30 F so no one had warm enough gear. You could barely see 50 feet in front of you. Our professional mountain guide insisted that it was fine for us to go ahead. I looked at the “Risk Balls” and decided that the Probability of a Severe accident (hypothermia, frostbite, high altitude pulmonary edema, high altitude cerebral edema) was way too high and finally talked the guide out of going. Our group stayed behind (as did most of the other trekking groups that day). The one group that tried to get over the pass didn’t make it. They had to turn back when one of their participants got severe frostbite. He wasn’t able to walk and they had to send a pony up to bring him back down. The moral of this story (similar to the Into Thin Air story) is that experts can and do make mistakes. If you see something that feels wrong or risky, Step Up and Say Something. If you don’t, you have become a significant People Hazard because of your silence. The final thought I’d like to leave you with is about our desire for risk. In our cultures, our socio-economic groups we can look at risk as something of a luxury. We don’t have to worry or struggle for each day to stay alive like many in the developing world. For these people there is only –R. Activities like kayaking, ropes courses, rock climbing, are foreign concepts. My choice to go whitewater paddling and placing myself at risk is at the self-actualization end of Maslow’s Hierarchy of Needs. I am pursuing +R by exposing myself to –R. Much of the rest of the world is still fighting just for the basics. They experience more than their share of –R with much more dire consequences. So I would ask each of us to think about how what we are doing to create self-actualization for those who already have so much, how that will come back as a positive impact on those who have so little. I hope that each of us will make the time within our organizations to wrestle with that question.